Vera has her MOT! She arrived home on Saturday morning. 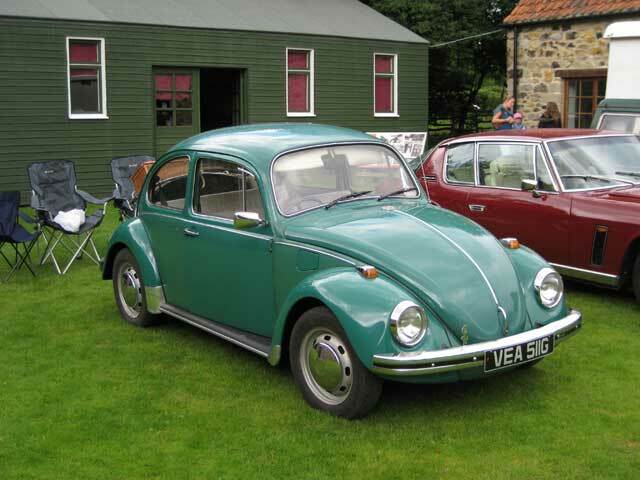 Well Vera is now is safely tucked up in her new home (my parents' garage) as Velvet (the new Beetle) insists on being stored in our garage. She passed her MOT (thanks to JP) with only an advisory on a brake cable. 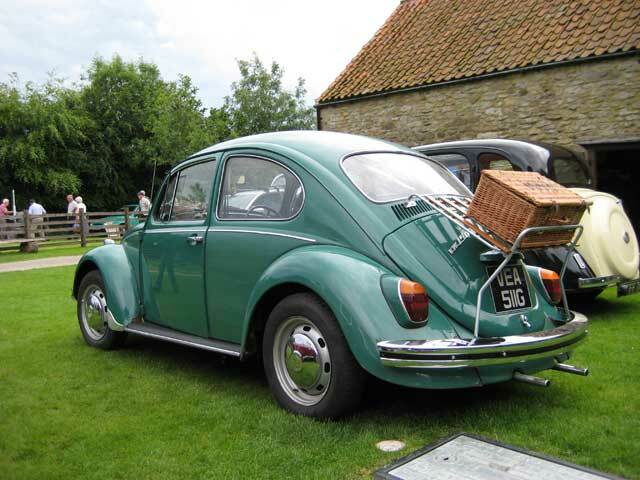 She drove back from York to Pickering with no problems and then clocked up about 100 miles in her first weekend by visiting NECPWA's Classic Car Rally at Sledmere. 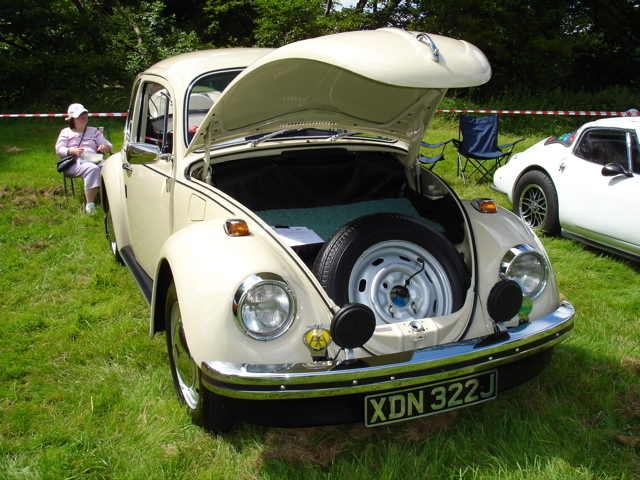 She was next to the most immaculate VW that I have ever seen - fully original 1970 with an engine that has been polished to perfection. The boys enjoyed playing inside her and then we got down to adding all of the accessories that we have been buying for her. 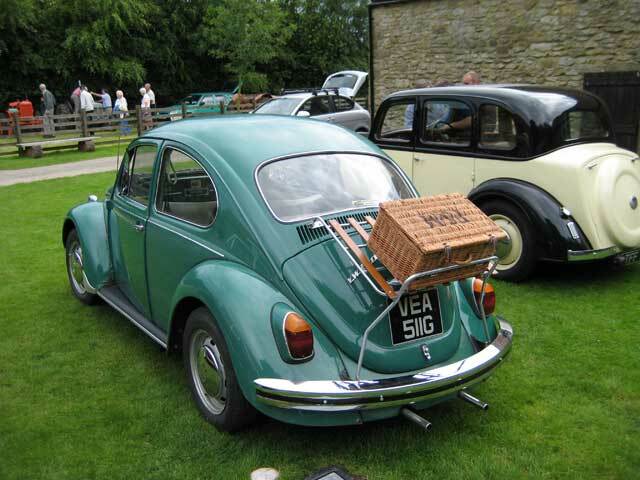 Rear decklid was fitted and the wicker hamper added a nice finishing touch. I had all kinds of fun fitting the GB Year Plate but eventually I put it in a place that looked okay but the decklid is going to cause problems so some relocation will be necessary in the future. Mr Bubblehead has fitted nicely onto the front bumper. Now that she is on the road I need to get a new wiper motor sorted out as the wipers didn't quite survive the drive back in the heavy rain and just stopped working altogether. Then finally I need to get the paintwork sorted then we can begin on waxoiling, extra wing mirror, mud flaps and general tidying up. Rear parcel shelf fitted in well and now all I need is a front parcel shelf. 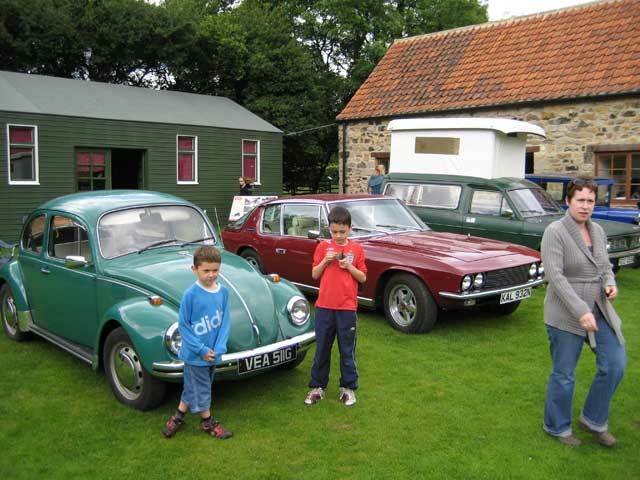 Vera has been out and about again - this time she visited Ryedale Folk Museum near home as part of a very select gathering from NECPWA. 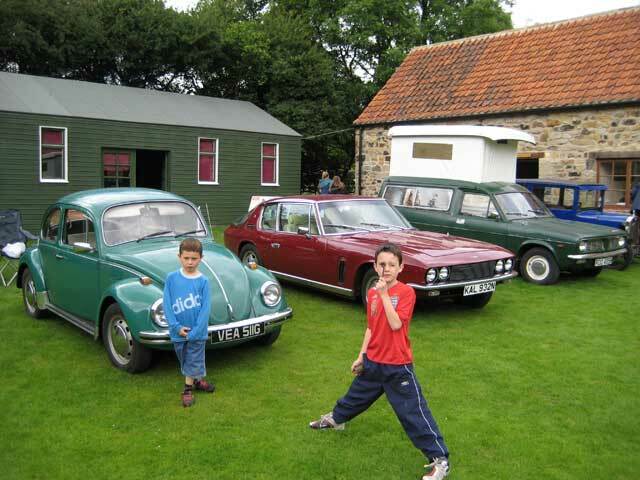 The Jenson Interceptor next to Vera has a 7 Litre engine! This is my favourite view of Vera. I have bought some beauty rings but they didn't fit so I must swap them when I get a chance. She is now waiting to be re-sprayed and that should be her done then apart from ongoing improvements such as deck chrome grilles, mudflaps and perhaps a nice wooden gear knob as seen in the 1969 VW Accessory brochure which also features the optional locking glove box lid which I fitted this weekend. Tony and Ellen's Suntor Marina got lots of attention as did the tiny little Austin 7 - which is 40 years older than Vera.